Valdo, an ambitious young apprentice working for Leonardo Da Vincis disciple, Francesco, is least happy when the scholar suddenly dismisses him. However, shortly afterwards, he receives a letter from a mysterious patron, asking him to locate one of the great s missing codices. To gain access to Da Vincis last residence, the Manoir du Cloux near Ambroise, Valdo tells its new inhabitant, a courtesan by the name of Babou de la Bourdaisière, that he is Francesco Melzis apprentice and that he wishes to examine the inventions that still remain on the estate. Under this cover, he starts to scour the estate: Babous bedroom, Leonardos workshop, the grounds, and dovecot, leaving no stone unturned. In the course of his investigations, he eners a wide array of intriguing acters: Saturnin, a suspicious looking guardian, as well as the King of France himself. To complete his mission, he has to solve a series of enigmas set by the great himself. On the trail of the genious, Valdo is no more aware of the secrets he is about to unveil as the danger lurking in store for him. - The first game game about the life of Leonardo Da Vinci giving players the opportunity to penetrate the hidden enigmas of his work. - A fascinating quest full of risks, new developments and discoveries. - Intuitive handling and interface. 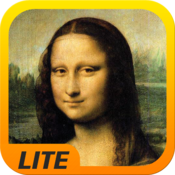 - Dozens of puzzles and enigmas based on the artists major work: the Mona Lisa, the flying machine, the Battle of Anghiari, Saint John the Baptist. - An exclusive partnership with the Clos Lucé, the last residence and now official museum of Da Vinci, a guarante of highly detailed historical respect. - Graphics of stunning realism and beauty: the Clos Lucé perfectly modelled in 3D. We cannot answer to reviews on the Mac App Store, feel free to contact us directly if you have any question. Please visit our site and forum below for additional information.